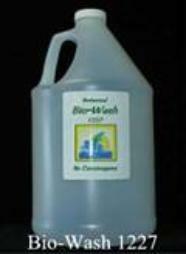 Bio-Wash is blended from processed extracts of natural plants. more efficiently and be more productive. Bio-Wash supplies nutrients to seeds, which encourages germination and vigorous growth. water for deeper and more rapid soil penetration. Bio-Wash increases frost protection from 32 to 27 degrees Fahrenheit. Bio-Wash increases the quality of grains and nutrients of crops grown. Brix/Sugar levels by up to 50%. Bio-Wash increases product yields from 15% to 300%. acquired resistance, defending plants from insects and fungus. Bio-Wash provides faster crop production in fields and greenhouses. production by growing a 3rd crop per annum. Has increased plant growth by 20% to 400% over a 3-month period of time for starter plants. • Persimmons have shown a growth rate of 4:1 over normal plants. Faster crops means less borrowing costs on crop loans. Nontoxic product can be sold to customers and other growers. Reduces chemical costs by up to 75%, with per gallon costs as low as seven cents ($0.07). ecologically and environmentally friendly environment. Bio-Wash is non-caustic, non-fuming, non-corrosive & non-explosive; it has no flash point. Sap, and plant-based wetting agents in a base of colloidal micelles. phosphoric acid, hydrochloric acid, citric acid or sulfuric acid. botanical cleaner, and plant tonic. spreading diseases from plant to plant or tree to tree. Self-cleans equipment applicators and reduces equipment maintenance costs. claiming insecticide exposure. No workers compensation fees charged to your business. No more Environmental Protection Agency paperwork on pesticides. No threat or concern over fees and fines levied by from EPA and OSHA guidelines. No more hazardous waste disposal requirements to follow. No concern over issues associated with registered pesticides or fungicides. No more closing down while spraying toxic chemicals. No warnings signs posted to protect customers or workers when spraying or applying. No concerns of toxic chemicals drifting into neighborhoods or runoff into water supply. No more liability from pollution mitigation on land sales-no cleanup of pesticides. No additional labor or costs required for associated spraying and handling.